Friday February 25th 1881 We girls walked over town this forenoon John and Hatt went down to the furniture store and got a new rocking chair for Mother. We went down to Kate Winchesters to the quilting and had a splendid day of it Hatt came home about five oclock but I stayed till night and Rob came and took Cressa and I to the exhibition a real pleasant day. 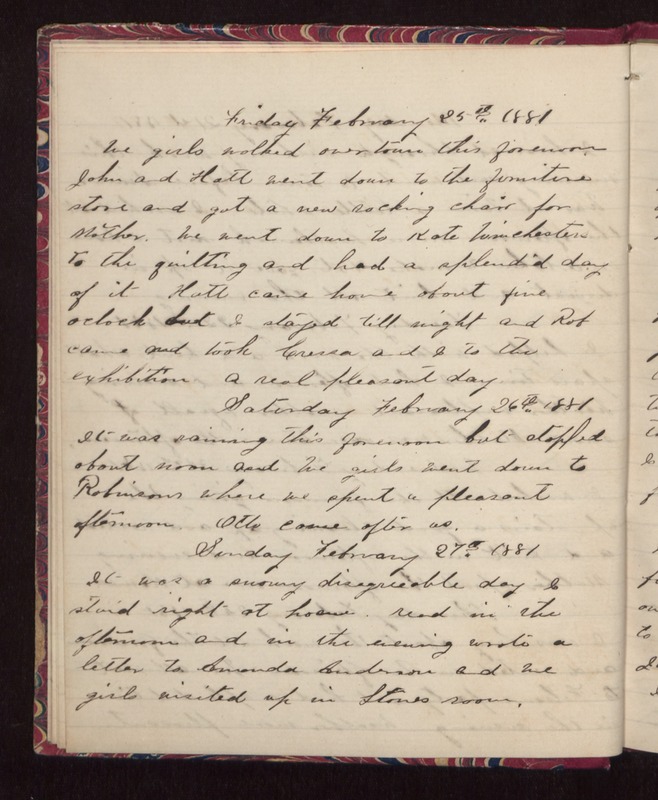 Saturday February 26th 1881 It was raining this forenoon but stopped about noon and we girls went down to Robinsons where we spend a pleasant afternoon. Otto came after us. Sunday February 27th 1881 It was a snowy disagreeable day I staid right at home. read in the afternoon and in the evening wrote a letter to Amanda Anderson and we girls visited up in Stones room.